Major Coptic leaders are condemning Mohamed Elibiary, an Obama administration Homeland Security adviser, for suggesting that Copts who raise awareness of anti-Christian violence in Egypt promote "Islamophobic" bigotry. Elibiary sent out a series of tweets that Coptic leaders found offensive last month. The tweets appeared to chastise the Coptic community for lobbying on behalf of their relatives in Egypt. He targeted them because they had aligned themselves with conservative groups that he called "Islamophobic." "VERY disturbing if true: bit.ly/18xotzi US DHS adviser accuses #Coptic #Christians of inciting Muslims! #Speechless! Pls comment!" Bishop Angaelos, Coptic Pope Tawadros II's personal representative in the United Kingdom wrote in a Sept. 28 Twitter post. Elibiary personally attacked Michael Meunier, president of Egypt's al-Haya Party, two days earlier after Meunier spoke with The Investigative Project on Terrorism (IPT) about Elibiary's earlier offensive tweets against the Copts. "Sad2c #Coptic @MichaelMeunier aid #Islamophobes anti US Muslim community agenda ....," Elibiary wrote. Meunier denounced Elibiary's personal attack, saying the issue had nothing to do with Islamophobia – but that Elibiary threw out a straw man to protect the totalitarian Muslim Brotherhood. "If you look at him you can definitely see that he is a sympathizer of the Brotherhood," Meunier said. "If you are in the Brotherhood you don't have a card. The guy put up the sign for R4BIA [on his Twitter account], a symbol for people who burn churches and kill people." Brotherhood defenders are trying to smear their critics as anti-Muslim bigots, rather than people concerned about Brotherhood violence and repression, Meunier said. "He has a grudge against my activism, my spending two months in Washington, highlighting the vicious activities of the Muslim Brotherhood." 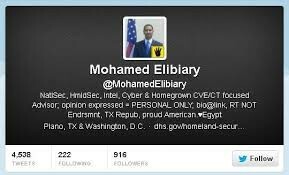 Elibiary initially defended sporting the R4BIA on his Twitter profile, saying "#R4BIA=#Freedom4ALL." But he relented to pressure Friday and removed it. "While I did remove #R4BIA twibbon as I updated my profile, my view & support of its human rights & pro democracy values continue. #AntiCoup," Elibiary wrote. R4BIA takes its name from Cairo's Rabia ad-Alawiya Square, where hundreds of Muslim Brotherhood protesters were killed in armed clashes with Egyptian security forces in August. The #R4BIA platform includes a litany of principles that run in open opposition to Western values. It invokes concepts such as: "pure martyrdom"; "unification of the Muslim World"; "the end of Zionists"; "the birth of a new movement for freedom and justice"; "justice for everyone against rotten Islamic values"; "the end of oil sheikhs"; and "the end of capitalists." "Western concepts such as democracy, human rights, freedom, equality and right to life, often exercised in a double standard, have utterly collapsed in Palestine, Syria, Bosnia and lastly in Egypt. With the spirit of the Rabia sign, these and similar concepts will be reinterpreted based on Islamic principles," the section "How did R4BIA emerge?" says. 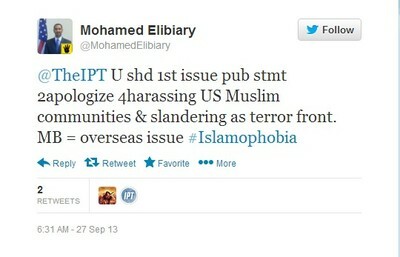 In a Twitter exchange with the IPT, Elibiary said that he has a nuanced view of the Muslim Brotherhood. But does his "nuance" include a private endorsement of the #R4BIA movement's stated goals? Elibiary is not talking despite several invitations by the IPT on Twitter to sit down in person and talk about his views on R4BIA and other issues despite his challenge for dialog. The R4BIA platform page makes extensive positive references to Sayyid Qutb, a Muslim Brotherhood leader executed in 1966 who explicitly called for violent jihad against infidels; his books are replete with massive anti-Semitic and anti-Christian dogma and conspiracies such as the Jews' control of world finance. Yet Elibiary repeatedly defends Qutb on Twitter and elsewhere. On Sept. 28, he posted a clip of an Arabic documentary about Qutb. He seemed perplexed when others questioned him about Qutb's extremism, telling one questioner he was "curious" about the label. Qutb called on Muslims to fight non-Muslims unless they pay the jizya or poll tax. That's a tribute given by non-Muslims to Muslims in exchange for allowing them to practice their religion and keep their lives safe. Qutb also advocated using violence against those who do not convert to Islam. Posting the #R4BIA icon on his Twitter has nothing to do with the Muslim Brotherhood, Elibiary claims, although it has been exclusively used by the Brotherhood and its supporters. He also insists that sporting the Muslim Brotherhood R4BIA banner on his Twitter account does not have anything to do with his professional duties as a member of the Homeland Security Advisory Council. But Elibiary takes a page straight out of the Muslim Brotherhood playbook, blaming "Israelis" for the torrent of criticism he has faced for his accusations against Christians and for his support of the Muslim Brotherhood. He went on offense on Twitter against the dozens of complaints about the yellow #R4BIA salute on his profile and accused them of "#R4BIAobia." Moreover, pictures of Hamas terrorists flashing the R4BIA salute have emerged on the Internet – reinforcing the ties between the terrorists and their Egyptian parent group. In the IPT's new documentary, "The Grand Deception," former Brotherhood member Abdurrahman Muhammad explains that even universal principles such as 'justice' have a different meaning to the Brotherhood than it does for Americans. Justice in the Islamist Muslim Brotherhood's eyes, Muhammad says, only exists when a state is ruled as a theocracy under Islamic law. "We will never have justice until we have an Islamic state because whoever doesn't rule by what Allah has revealed is an oppressor," Muhammad says in the film, explaining Muslim Brotherhood thought. Brotherhood apologists such as Elibiary attempt to define the Brotherhood as "moderate." Yet Rafik Habib, a Coptic Christian Brotherhood apologist whom Elibiary respects, told American diplomats that even the "left-wing" of the Islamist group were not "moderates" in a Western sense. He said their goal was a "religious state where Sharia is applied to all aspects of life." Habib has been among the Muslim Brotherhood's most noteworthy non-Muslim defenders in Egypt and was appointed to head the Brotherhood's Freedom and Justice Party (FJP) in September. Elibiary did not reply when the IPT asked him if he was willing to condemn extremist and racist statements and actions by Muslim Brotherhood leaders. These included threats of expelling the Copts if they did not accept Sharia, Muslim Brotherhood's Supreme Guide Mohamed Badie's description of Jews as the sons of "apes" and "pigs," and Qutb's violent statements about Muslim relations with non-Muslims. Elibiary deflected and attacked the IPT instead. Again taking a page out of the Muslim Brotherhood and Hamas strategy, Elibiary claims that much of the opposition to the Muslim Brotherhood in the United States "is really anti-Islam bigotry." Although his Twitter account and other public statements clearly support the Muslim Brotherhood, he denies being a member. Any such belief is an accusation fabricated by "Islamophobes," he says. "This guy should not have access to the information he has access to [as a DHS adviser with a security clearance] or be able to provide the expertise he provides," Meunier said. "By putting this sign on his picture, he is declaring himself to be a terrorist sympathizer…. This guy is an anti-Christian." Elibiary dismisses the idea that the Muslim Brotherhood has engaged in terrorism and says those who connect the two are mistaken. But Meunier points to the attacks against his fellow Copts by Muslim Brotherhood supporters in August as evidence the terrorist designation is warranted. "To have a U.S. official who even declares himself a counter terrorism expert supporting terrorists is jeopardizing the national security of the U.S." says Meunier. He attacked the Copts again late last month after an IPT blog highlighted the connections and sympathies many American Islamist groups have with the Muslim Brotherhood. Elibiary lectured the Copts after the blog appeared for attacking groups such as the Islamic Society of North America (ISNA) because of their historic connections to the Muslim Brotherhood, and for their alignment with so-called "Islamophobes". He then called the Copts' work with "Islamophobes" and their criticism of American Islamic groups contrary to the cause of religious freedom. The tweet specifically referenced an article in the Arabic-language online publication "Copts Today." It featured a reference to Investigative Project on Terrorism founder and Executive Director Steven Emerson discussing ISNA's extremist ties. Pointing out ISNA's Muslim Brotherhood roots is not an attack. It's an established fact. Federal prosecutors say exhibits admitted into evidence in a Hamas-support trial show ISNA's "intimate relationship with the Muslim Brotherhood." The federal judge in the case found "ample evidence" connecting ISNA to Muslim Brotherhood operations known as the Holy Land Foundation (HLF), the Islamic Association for Palestine and Hamas. HLF was an Islamic charity convicted in 2008 of being a Hamas money-laundering operation. In a 2007 op-ed, Elibiary dismissed the evidence submitted in the HLF trial as "a case largely built on associations to convict First-Amendment-protected rights." He reaffirmed his earlier position in his recent interview with journalist Ryan Mauro published by the Center for Security Policy. ISNA tried to moderate its public image; however, it has kept radicals such as Jamal Badawi on its board of directors, and granted a 2008 community-service award to Jamal Barzinji, a founding father of the Muslim Brotherhood in America, as well as a former ISNA board member. Badawi has defended violent jihad including suicide bombings, the beating of women by their Muslim husbands, and has suggested that Islam is superior to secular democracy. Barzinji was named in a federal affidavit as being closely associated with Palestinian Islamic Jihad and Hamas. Barzinji's name appears in a global phone book of Muslim Brotherhood members recovered by Italian and Swiss authorities in November 2001 from the home of Al-Taqwa Bank of Lugano founder Youssef Nada, one of the leaders of the international Muslim Brotherhood. He was listed as an al-Qaida financier by the United Nations but was later removed for reasons that are unclear. His name also appeared in an address book belonging to Mousa abu Marzook, deputy director of Hamas's political bureau. Elibiary ignores these court-tested links between ISNA and the Muslim Brotherhood and casts them as conspiracies "against US Muslims 2manufacture controversies." But Elibiary rejects just about everything dealing with the HLF case. Despite his stated opposition to Hamas, Elibiary remains a staunch apologist for the HLF. "The purpose of creating the Holy Land Foundation was as a fundraising arm for Hamas," U.S. District Judge Jorge Solis said when he sentenced five HLF officials following sweeping convictions. Marzook founded HLF, originally called the Occupied Land Fund, or OLF. Internal records and FBI recordings show the group was the official fundraising arm of the Palestine Committee, an umbrella organization created by the Muslim Brotherhood for Hamas-support in the United States. Elibiary criticized federal prosecutors for releasing a list of 300 unindicted co-conspirators in the trial, including ISNA and the Council on American-Islamic Relations (CAIR), because it "implicates most of the Muslim community in a wider conspiracy." Despite the verdicts, Elibiary slammed the underlying law criminalizing material support for terrorists and claimed it criminalized "traditionally innocent activities such as charity." "We are using the Al Capone approach a lot of times in these material support cases where we're trying to get people prosecuted for one thing because of some other issue we have with them," Elibiary said at a March 2010 House Homeland Security Committee hearing. "Sometimes it's because of the lack of evidence that's available to convict them directly, as well as we have, in the Holy Land Foundation trial, lumped in a whole bunch of unindicted co-conspirators and caused a great deal of damage to community relations between law enforcement and the community. "And then that's counterproductive, and it's a defeat for us long term as a country to increase cooperation." Elibiary's assertion that there was "a lack of evidence" in the unanimous conviction of Hamas funders in the HLF trial speaks for itself. As for his claim that there was no evidence to designate other radical Islamist groups as un-indicted co-conspirators, both the presiding judge and the 5th Circuit Court of Appeals reject attempts to purge the co-conspirator list. In defending HLF, Elibiary failed to disclose his personal ties to HLF and its convicted president, Shukri Abu Baker. Elibiary discussed his ties to Abu Baker at length in his interview with Mauro, saying he had been involved with Abu Baker and the HLF since he was 16 years old. Trial evidence, especially from secret FBI recordings, show that Abu Baker was a staunch Hamas supporter. He attended a 1993 meeting of Hamas activists monitored by the FBI that was called to plot ways to "derail" U.S.-led peacemaking efforts. Part of the concern was that the deal on the table would marginalize the Islamist Hamas movement. Abu Baker suggested that American Islamists should "camouflage" their work in order to be successful. "I swear by God that war is deception. War is deception. We are fighting our enemy with a kind heart, and we never thought of deceiving it," Abu Baker said at the 1993 meeting. "Deceive your enemy. "Yes, politics – like war – is deception." Other exhibits showed the flow of millions of dollars from HLF to Palestinian charities controlled by Hamas. A 1991 letter to Abu Baker detailed that control. Other exhibits showed Abu Baker authorizing the wire transfers. Despite such overwhelming evidence and Abu Baker's conviction, Elibiary accused the federal government of engaging in a "political" prosecution. Abu Baker never did anything criminal, Elibiary argued. Only participation in active terror plots should be subject to law-enforcement scrutiny, he said in subsequent remarks. "What the government should be working to counter is violent extremism, which is the action part or the planning for an action to do some violence because it's the violence that's illegal," Elibiary said in a March 2009 forum at the Roxbury Mosque near Boston. "Holding the viewpoints or expressing them is constitutionally protected." So in Elibiary's view, raising money to help the families of suicide bombers and imprisoned terrorists should be considered "protected speech." That's a rather strange formulation for a man advising the federal government on homeland security. In other Twitter posts, Elibiary claimed to understand and sympathize with the plight of the Copts. Elibiary suggested that as a Muslim, allegedly oppressed by political "Christianists," he understood what the Copts have experienced better than most Egyptians since Morsi's fall. But no Christians are seeking a jizya from American Muslims. And no Christian groups are rampaging through Muslim communities, torching mosques and beating Muslims along the way. That's the reality Copts endure in Egypt. The situation faced by Copts in Egypt is akin to that faced by blacks in America in the era of Jim Crow laws, when they were denied equal protection under the law. "It is not Anti #Copt when I welcome fair analysis encouraging US #Copts 2 stop working w/ #Islamophobes 2attack American Muslim Ldrs & orgs," Elibiary tweeted on Sept. 15 in defense of his attacks on Coptic activism in the U.S. He mentions the church burnings in an Aug. 20 tweet in which he thanks the Washington Post for publishing an account by an anonymous "high-ranking Western official" denying the Muslim Brotherhood's involvement. "… Sad what copts experiencing & I'm aware also MB condemned," Elibiary tweeted on Aug. 18. Yet an Aug. 14 memo that appeared on the Facebook page of a local office of the Muslim Brotherhood's Freedom and Justice Party appeared to give its blessing to church burnings and other attacks. "Burning houses of worship is a crime. And for the Church to adopt a war against Islam and Muslims is the worst crime. For every action is a reaction," the memo said. Elibiary's defense of extremist ideologies and figures raise questions about his judgment and fitness for the advisory position he currently holds that he and administration officials refuse to answer. Sounds to me that Mohamed Elibiary is the bigot, an anti-Christian, pro-jihad bigot. Scary that that's the type the President Obama selects to provide him with his understanding of the Middle East and that US policy then gets based upon it. What's even more sickening is that many Americans actually believe that the President and the State Department actually represent American interests. It seems to me that they are actually representing anti-American interests...pro-actively.